The above info came from Julie Tran, and was edited by yours truly (contact me). The image came from Pop Arena. The Littl' Bits was a cute series about little dwarf-like creatures that lived in the Foothill Forrest. 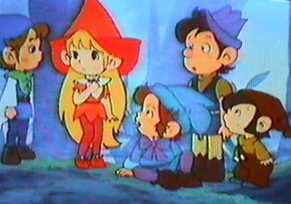 This series revolved around the adventures of its residents: Lillabit, Williebit, Snoozabit, Browniebit, Snagglebit, and the elder dwarf, Elderbit.